have full traceability of all meat etc., reduce the carbon footprint and support local business) and ensure that the children receive high quality home cooked food. Dinners are ordered via our online payment system called ParentPay. Menus appear on the school website each Wednesday for the following week. This gives the opportunity for you to sit with your child to select the food for the coming week. You then log onto ParentPay where you select and pay for your choice of dinners. On the day selected your child will be given a coloured band, linked to their choice which they swap for their dinner at the serving hatch. As you may be aware from the news, the government have introduced a new scheme starting September called Universal Free School Meals. 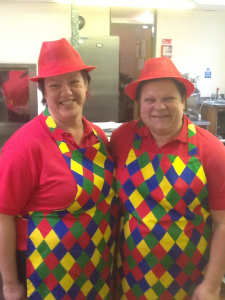 This provides all children from Reception class through to the end of Year 2 with a free meal at lunchtime. This means that you will not have to pay any money for the school dinners at Highfields during this period. This is a potential saving of £2.20 per day, around £400 per year! 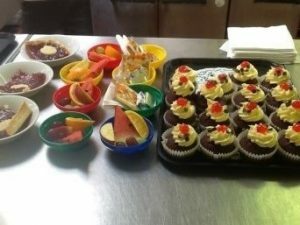 The children receive a choice of main item plus a selection of vegetables, as much as they like from the salad cart and a choice of pudding. There is also always a selection of fruit available. Baked potatoes are also available daily, again with a choice of fillings. Drinks are provided on the tables for all the children. If you are entitled to free school meals under the old system i.e. if you are unemployed or on low income, I would urge you to still make an application for this even though you will automatically be entitled to the free school meals above. This is so that the school can access additional funds to support your child in their learning. Each application gives us an additional £1300 per pupil. It makes a huge difference to us in the services we can offer. This last year it has paid for an additional teacher offering 1:1support to children two days a week. Please ask if you need more details. You can see how use this funding by looking on our school website. 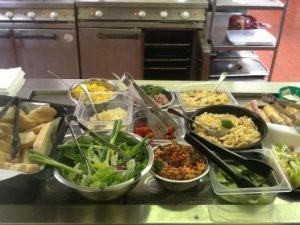 For KS2 we also run a “Just for Juniors” Menu (white option) which includes pasta pots, curry pots, pizza and paninis to name a few.